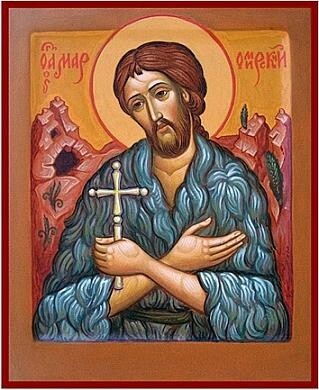 Eternal Orthodox Church calendar for the 07.02 year 2017. Gregory was born in Nazianzus of a Greek father and a Christian mother. Before his baptism, he studied in Athens along with Basil the Great and Julian the Apostate. Gregory often prophesied that Julian would become an apostate and a persecutor of the Church which actually happened. Gregory was especially influenced greatly by his good mother Nonna. When he completed his studies, Gregory was baptized. St. Basil consecrated him as bishop of Sasima, and Emperor Theodosius the Great summoned him to fill the vacant archepiscopal throne of Constantinople. He wrote numerous works of which his most famous are those concerning theology for which he is called The Theologian. Especially known because of its depth is his work: Homilies on The Holy Trinity. 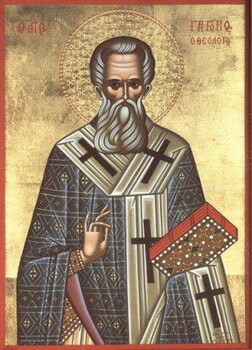 Gregory wrote against the heretic Macedonius who erroneously taught that the Holy Spirit is a creation of God and, Gregory also wrote against Appolinarius who erroneously taught that Christ did not have a human soul but that His divinity was in lieu of His soul. Additionally Gregory wrote against Emperor Julian the Apostate, his one-time colleague in school. In 381 A.D., when a debate began regarding his election as archbishop, he withdrew on his own and issued a statement: "Those, who deprive us of our archepiscopal throne cannot deprive us of God." After that, he left Constantinople and went to Nazianzus and there lived a life of solitude and prayer, writing worthwhile books. Even though he was in poor health throughout his entire life, nevertheless, Gregory lived to be eighty years old. His relics were later transferred to Rome. A reliquary containing his head reposes in the Cathedral Church of the Assumption in Moscow. He was, and remains, a great and wonderful light of the Orthodox Church as much by his meekness and purity of character as well as for the unsurpassable depth of his mind. He died in the Lord in the year 390 A.D.
At first, Publius was a senator. Recognizing the light of Christ, he left his worldly honors, distributed his possessions to the poor and devoted himself to a life of asceticism in the proximity of his town Zeguma on the Euphrates river. He established two monastic communities and died in the year 380 A.D. Mares was distinguished by external beauty and a sweet-sounding voice. He withdrew from the world and lived in a hut for thirty-seven years, in fasting and cleansing the heart of impure thoughts. As a ninety-year old man, Mares died in the Lord in the year 430 A.D.
As a Christian, Felicitas was condemned to death along with her seven sons during the reign of Emperor Antoninus in the year 164 A.D. She implored God only that she not to be killed before her sons, so that she might be able to encourage them during their torture and death in order that they would not deny Christ. According to God"s Providence, it so happened. With joy, this superb mother accompanied her sons one by one until she had witnessed the death of all seven sons. Then, she herself, with gratitude to God, received a martyr"s death. 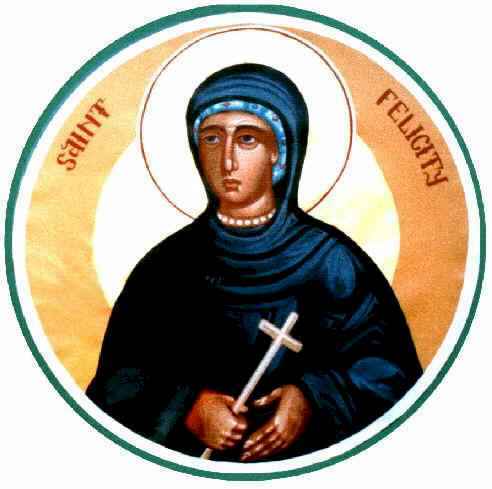 She and her sons suffered in Rome where their relics repose. Saint Anatole (Zertsalov) was born in the village of Bobolya on March 24, 1824. His father, Moses Kopev, was a deacon, and his mother’s name was Anna. The parents were exceptionally devout Christians who hoped that their children would enter the monastic life. Their only son Alexis was taught to read from the age of five. He was studied at the St Boris Theological Seminary, then later he entered the seminary at Kaluga. When he was fourteen, Alexis was stricken with a fever which kept him out of school for a year. From a very early age, Alexis wanted to become a monk. He even thought about going to the Roslavl forests to live with the hermits at that place. His plans were not fulfilled, however, because a thunderstorm prevented him from continuing on his way. He decided to turn back, regarding the storm as a sign that God did not wish him to proceed on his journey. The young man returned to seminary, where he was renamed Alexis M. Zertsalov. Sometimes students at Russian seminaries were given new names, as was the case with St Innocent Veniaminov (March 31). After being healed of tuberculosis, he arrived at Optina Monastery with his mother. St Macarius (September 7) praised her for setting her son on such a good path. The Elder took Alexis under his wing, instructing him in the Jesus Prayer, and in the principles of the spiritual life. When Fr Macarius was too busy, he blessed Alexis to seek advice from Fr Ambrose or Fr Anthony. Alexis fulfilled various obediences in the monastery, beginning in the kitchen. He did not get much sleep, and then only on the wood pile. He was frequently transferred from cell to cell, and he experienced many sorrows and trials. These difficulties taught him the virtues of humility and patience. 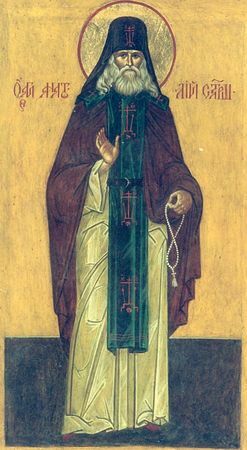 St Ignatius Brianchaninov (April 30) once visited Optina hoping to meet and converse with monks experienced in the spiritual life, and was referred to Fr Anatole, who was then a deacon. The bishop was impressed with Fr Anatole, and related the details of their conversation to Fr Macarius. The Elder began to beat him with his staff, and ordered him out of the room. When someone asked why he had been so harsh, Fr Macarius said, “Why shouldn’t I scold him? It’s easy to become proud.” After Fr Macarius reposed in 1860, Fr Anatole became very close to Fr Ambrose. When Fr Ambrose noticed that Fr Anatole was mature enough to guide others, he began to train him for this service, just as Fr Macarius had trained him. Fr Anatole was ordained to the priesthood in 1870. On August 3, 1871 he was assigned as Superior of the Spassky-Orlov Monastery, and raised to the rank of archimandrite. Fr Anatole did not wish to leave Optina, and Fr Ambrose made a formal request to have him assigned as his assistant, and so the appointment was made. Fr Anatole was made Superior of the Skete in 1874, at the urging of Fr Ambrose. Fr Anatole accepted these duties out of obedience to his Elder, and fulfilled them to the best of his ability. Even in his new position, Fr Anatole continued to respect and obey Fr Ambrose. Fr Ambrose’s cell was to the right of the doors to the Skete, while that of Fr Anatole was to the left. Visitors to one often went to see the other, as well. In addition to receiving visitors, Fr Anatole maintained a correspondence with many people who relied on his advice. Fr Ambrose, because of his illness, relied greatly on Fr Anatole in ordering life at the Shamordino Convent. He told the nuns that he rarely visited them because of his confidence in Fr Anatole. Fr Ambrose called him a great practicioner of the Jesus Prayer, who had received grace and the gift of unceasing prayer. Only one in a thousand received such grace, he informed the nuns. Near the end of his life, Fr Anatole had atained the same spiritual wisdom, discernment, and clairvoyance possessed by Fr Macarius and Fr Ambrose. He saw the secrets of the human soul, and was able to foretell future events. After Fr Ambrose’s repose in 1891, the bishop (who did not approve of Fr Ambrose) forbade Fr Anatole to visit Shamordino. This caused him deep sorrow, which affected his health. He traveled to St Petersburg in 1892 and met with St John of Kronstadt (December 20). On October 10, the anniversary of Fr Ambrose’s death, they served together. Doctors in the capital examined him and found that his heart and lungs were not good. Fr Anatole’s health grew worse during 1893, and on October 10, he was secretly tonsured into the Great Schema. St Anatole fell asleep in the Lord on January 25, 1894, and was buried near his beloved instructors St Ambrose and St Macarius. The Moscow Patriarchate authorized local veneration of the Optina Elders on June 13,1996. The work of uncovering the relics of Sts Leonid, Macarius, Hilarion, Ambrose, Anatole I, Barsanuphius and Anatole II began on June 24/July 7, 1998 and was concluded the next day. However, because of the church Feasts (Nativity of St John the Baptist, etc.) associated with the actual dates of the uncovering of the relics, Patriarch Alexey II designated June 27/July 10 as the date for commemorating this event. The relics of the holy Elders now rest in the new church of the Vladimir Icon of the Mother of God. 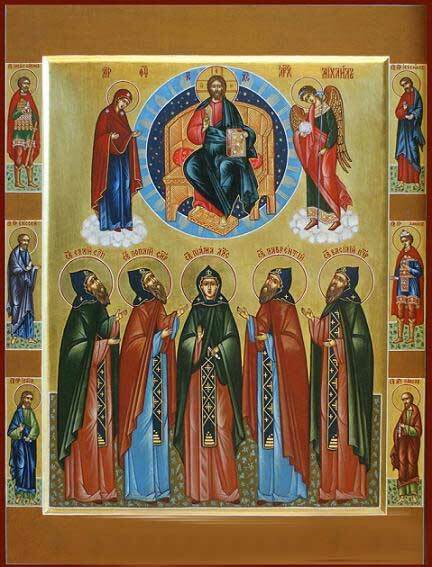 The Optina Elders were glorified by the Moscow Patriarchate for universal veneration on August 7, 2000. The holy New Martyr Auxentius was born in 1690 in the diocese of Vellas, part of the Metropolitan district of Ioannina in Greece. When he was a young man, he moved to Constantinople with his parents and became a furrier. Later, he left his trade and went to work on the ships, leading a sinful life in pursuit of worldly pleasures. His Moslem coworkers turned against him and accused him of denying Christ to embrace Islam. Fearing that they would denounce him to the captain of the ship, Auxentius jumped ship and returned to Constantinople. Auxentius bought a small boat and earned his living with it. He began to regret his previous conduct, and the desire for martyrdom grew within him. One day, a monk got into his boat in order to cross the water. This was Father Gregory, a monk of Xeropotamou Monastery on Mt. Athos. He revealed to Father Gregory his desire to be a martyr for Christ. The wise monk praised his desire, but urged caution lest he should weaken under torture and deny Christ. He recommended that Auxentius move to a quiet place and become a monk. Heeding Father Gregory’s advice, Auxentius continued to work with his boat for a time, giving most of his money to the poor, and living as an ascetic. Auxentius often prayed at the church of the Life-Giving Fountain, asking God to give him strength to become a martyr. Then he returned to his old ship, where his former shipmates began to beat him. They dragged him before the kadi, stating that he had converted to Islam, but then returned to Christianity. Auxentius said, “I was, and am, an Orthodox Christian. I am prepared to suffer thousands of tortures for the sake of Christ.” The furious Hagarenes began to beat Auxentius with an iron bar. He lost an eye and several teeth as a result. He remained steadfast in confessing Christ, in spite of all the tortures that were inflicted upon him, and absolutely refused to become a Moslem. Father Gregory went to see Auxentius in prison, and was asked to bring him Holy Communion on his next visit. The monk did this, also urging him to remain strong in the Orthodox Faith. The holy martyr was brought before the vizier, who urged him to respect Islam as good and true, instead of treating it with contempt. St Auxentius answered that he would never abandon his faith. In fact, he even urged the vizier to become a Christian. This enraged the vizier, and he sentenced Auxentius to death. After praying for all Orthodox Christians, and for the whole world, St Auxentius was beheaded on January 25, 1720 at 9:00 A.M. Two days later, a heavenly light was seen by Christians and Moslems, shining on the body of the martyr. The sultan’s tailor, an Orthodox Christian named Michael, went to the sultan and asked for the body. Patriarch Jeremiah III accompanied the body to the Church of the Life-Giving Fountain for the funeral and burial. Two years later, when the saint’s relics were exhumed, a sweet fragrance came forth from them. 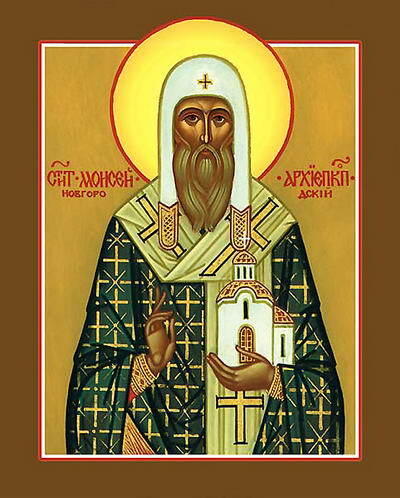 Saint Moses, Archbishop of Novgorod (1325-1330, 1352-1359), in the world Metrophanes, was born at Novgorod. In his youth he secretly left his home and entered Tver’s Otroch monastery, where he became a monk. His parents found him, and at their insistence he transferred to a monastery near Novgorod. At this monastery he was ordained as a hieromonk, and later he was appointed archimandrite of the Yuriev monastery. After the death of Archbishop David of Novgorod, St Peter (December 21) consecrated Moses as Archbishop of Novgorod in 1325. This was the first episcopal consecration to be performed in Moscow. St Moses did not guide his Novgorod flock for long, however. The quarrels and contentious factions, the conflagrations and other misfortunes weighed heavily on his soul, which sought monastic solitude. After four years, he petitioned to be allowed to retire and live in asceticism. He was succeeded by St Basil. In 1330 the saint withdrew to the Kolmov monastery for tranquillity. He did not remain here very long, either. He found a desolate spot at Derevyanitsa, where he built the stone church of the Resurrection of Christ. At this place the monk spent more than twenty years at monastic deeds. After Basil’s death, St Moses yielded to the requests of the Novgorod people to be their archpastor once again. 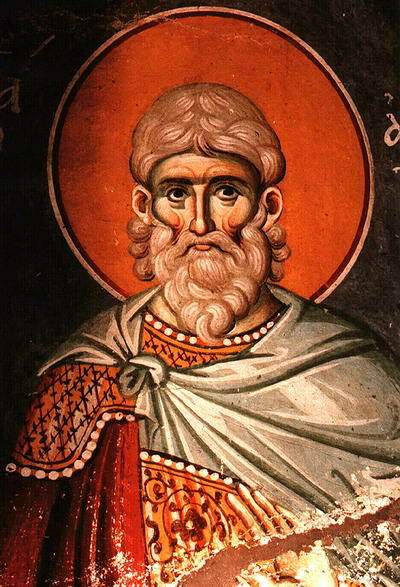 The ancient chronicler describes St Moses in this way: “He shepherded his flock as a good pastor; he defended the downtrodden, and protected destitute widows; he employed a company of copyists, and because of him many books were written, and he confirmed many in piety by his guidance.” In the year 1354 Patriarch Philotheus of Constantinople (1354-1355, 1364-1376), as a token of his deep respect for St Moses gave him permission to wear polystavrion vestments (“many crosses”), and even sent him a set. He also permitted St Moses to deal directly with the Patriarch of Constantinople without intermediaries. Archbishop Moses continued as hierarch for seven years, a period marked by the building of many churches in Novgorod and its environs. In 1352 the saint built a stone church in honor of the Dormition of the Most Holy Theotokos at Volotova; in 1355 a monastery was built in a place named Skovorodka, with a stone church in honor of the holy Archangel Michael. In 1357, churches were also built at three monasteries: at Radogovitsa near the Volotov Dormition church, and at the Holy Spirit monastery and at a women’s monastery, churches named for St John the Theologian (the first and third of these monasteries were founded by St Moses). In 1359, feeling weak and sick, the saint withdrew into the Monastery of the Archangel Michael in Skovorodsk which he had founded. St Moses labored here in asceticism until his death on January 25, 1362. He was buried at the cathedral church. Archbishop Sergius of Novgorod, who came there from Moscow in 1484, ordered to a priest to open the grave of St Moses. “I dare not be so bold as to open up the relics of the hierarch. It is your task as hierarch to open the grave of a hierarch,” he answered. “Look what is on this corpse,” said the infuriated archbishop, but he was soon punished. He went insane, and was not able to govern the diocese and did not become well until he took the schema at the Khutyn monastery. He died in 1504 at the Trinity-Sergiev monastery). The Feast of St Moses on April 19 commemorates the uncovering of his incorrupt relics in 1686.